The classic literature on predation dealt almost exclusively with solitary predators and their prey. Going back to Lotka-Volterra and optimal foraging theory, the theory about predation, including predator-prey population dynamics, was developed for solitary species. Various consequences of sociality for predators have been considered only recently. Similarly, while it was long recognized that prey species can benefit from living in groups, research on the adaptive value of sociality for prey species mostly emerged in the 1970s. 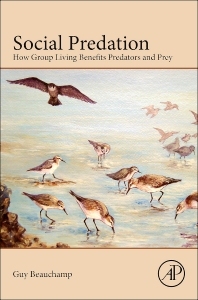 The main theme of this book is the various ways that predators and prey may benefit from living in groups. The first part focusses on predators and explores how group membership influences predation success rate, from searching to subduing prey. The second part focusses on how prey in groups can detect and escape predators. The final section explores group size and composition and how individuals respond over evolutionary times to the challenges posed by chasing or being chased by animals in groups. This book will help the reader understand current issues in social predation theory and provide a synthesis of the literature across a broad range of animal taxa. 3.3 Are Antipredator Ploys Effective? 8.2 What Is a Mixed-Species Group? Guy Beauchamp is a behavioural ecologist specializing on social foraging in birds. He has written over 100 articles in peer-reviewed journals. He has been studying sandpipers for the last 10 years. He currently works as a research officer at the Veterinary College of the University of Montreal, Quebec, Canada.